On December 13, 1812, Cyrenus Chapin writes to Colonel S. Van Rensselaer. "This part of our country," he memorably starts, "seems destined to be the theatre of events both strange and new." 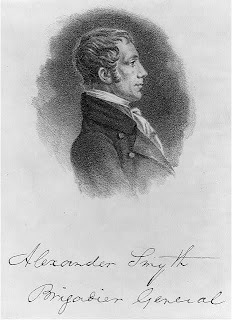 He is writing to describe the duel between General Smyth and Moses Porter that took place on December 12. Both men had gone to Grand Island to fight their duel. They exchanged shots at twelve paces apart but both missed. It was noted at the time that the "The expected tragedy proved to be a solemn comedy." More sympathetically, it was not uncommon for men engaged in duels to miss intentionally thus saving their honour and their lives. General Smyth was soon discharged. He is now remembered for his botched invasions of Canada, for being the author of the U.S. army drill manual used during the war - borrowing heavily from French manuals - and for his gasconading proclamations.